so if there is a problem it's because I'm new. 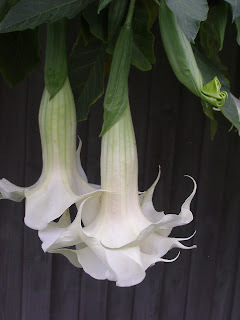 I have been growing Brugmansia 'Angel Trumpets' for no less then 20years and have had a dedication to the plant family Solanaceae for that time also. I have a collection of many Genera and species from this family such as Capsicum, Nicotiana, Solanum, Datura, Atropa, Hyoscyamus & Brugmansia. So please come on a Journey with me and see what we can do together. NOTE:::: I MUST STATE THAT ALL PARTS OF THE PLANT INCLUDING SEED ARE POISONOUS IF INGESTED!